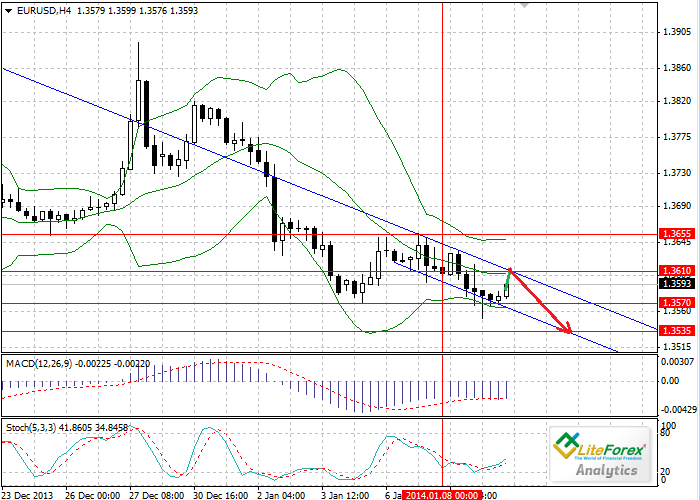 On Wednesday currency pair EUR/USD smoothly went down reaching five-week lows of 1.3553. The rise in the USD was caused by the minutes of the last meeting of the US Fed, which said that many of the Committee members admitted decline in efficiency of QE3. Investors expected that volumes of bond purchase would continue to decrease, thereby increasing demand for the American currency. Today the USD can strengthen due to the report of the U.S. Department Labour on number of initial applications for unemployment benefits. According to projections, this index will go down, amounting to 335 thousand. At the moment the pair is experiencing correction in the downward channel, moving to the level of 1.3610 (middle line of Bollinger bands indicator and upper limit of the channel. From this level the price may reverse and go down to support levels of 1.3570 and 1.3535. On the four-hour chart technical indicators confirm correction. MACD histogram is in the positive zone; its volumes are decreasing. Stochastic lines are directed upwards. It is advisable to open short positions with the target of 1.3535 if the price reaches the level of 1.3610.